Mary Lloyd Moore, executive director of the Suzanne Vitale Clinical Education Complex at WKU, announces the new 'LifeWorks at WKU' program. An innovative residential program to prepare adults with autism spectrum disorder for transition to the workforce was announced April 12 at Western Kentucky University in Bowling Green. 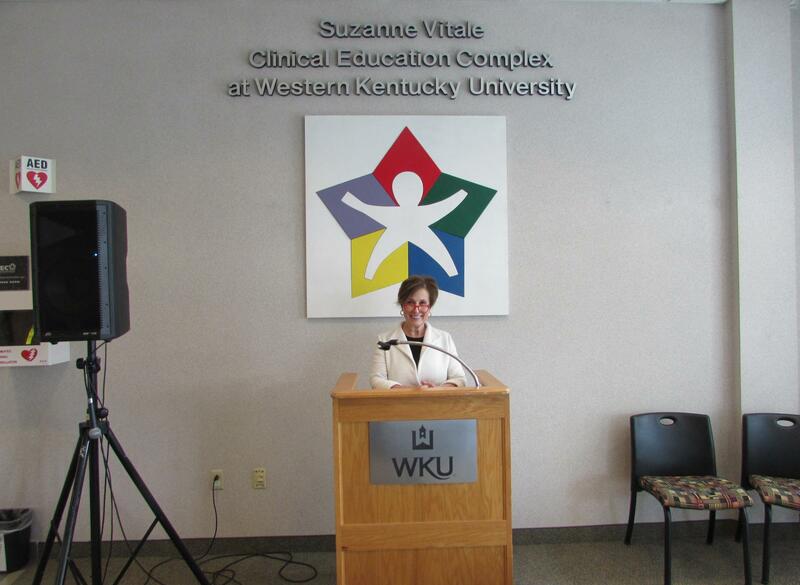 Mary Lloyd Moore is executive director of the Suzanne Vitale Clinical Education Complex at WKU. She said the project called 'LifeWorks at WKU' will begin in the Fall of 2020. “We plan for it to be a two-year residential program whereby there will be supported living, supported employment, supported community engagement, and education for relationship skills in the community at home and in life,” said Moore. She said the residence will be apartment living located within a block of the Clinical Education Complex. It will house up to 26 people. She said state-mandated services for people with disabilities end when they reach 21 and the new program will fill a critical gap. Moore said the innovative program could become a model for Kentucky and the nation. The program is affiliated with WKU, but is privately funded by community supporters. The Clinical Education Complex has been working with several community partners since 2015 to develop the LifeWorks at WKU program to help individuals with autism spectrum disorder transition to independent living, secure employment and engage in commmunity and leisure activities. Community partners include LifeSkills, Bowling Green Housing Authority, Office of Vocational Rehabilitation, Sunrise Children's Services and Wabuck Development company. The Clinical Education Complex was created in 2006 when the university responded to the community need for trained autism professionals to support families and children from age two through high school. The Kelly Autism Program's Circle of Support, founded in 2003, serves WKU students with autism. The addtion of LifeWorks at WKU will now serve individuals on the autism spectrum for as long as services are needed. Moore said parents will of those with ASD will pay for the residential program. She said there are few programs similar to LifeWorks at WKU and the Bowling Green initiative is unique because it is attached to a university. The program will offer training opportunities for students in academic programs including medicine, social work, communication disorders, psychology and counseling. An Owensboro nonprofit that serves people with developmental disabilities is suspending its autism program. The CEO says the autism program will undergo a major restructuring to better serve its clients, who are students in elementary, middle and high school. Wendell Foster is a nonprofit that’s been serving people with disabilities for 72 years. The autism program began as a satellite location for the Kelly Autism Program at Western Kentucky University, but eventually the Owensboro program became independent. The current autism program in Owensboro has been offered as an afterschool program a few hours a week, which has an average of 15-20 students, and a summer camp three days a week, which usually has about 30 students.